Join us as we partner with Leaps of Faith Waterskiing for a fun filled day at Chapman Lake! With 20+ years of expertise behind their organization, they’re capable of handling virtually all levels of ability so that everyone can enjoy the experience. Of course, if you are not sure waterskiing is your thing, you can try tubing as well, or join us in cheering others along while enjoying the lake and good company. The date of the event is August 10th and 11th. Skiing will run from 9:00 a.m. until approximately 4:00 p.m. A picnic lunch will be provided and is scheduled for noon. Everything is FREE, and family and friends are also encouraged to attend/participate. Skiing is available to family and friends, time permitting. Even if it’s just to enjoy some time by the lakeside, come join us! Registration is required. In order to insure that we offer this opportunity to the most people as possible, and don’t have open skiing/tubing spots, we are requiring a refundable $10 registration for anyone who wishes to participate in skiing/tubing. 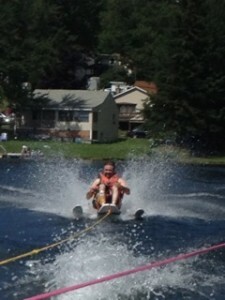 Check out this video of one of our members enjoying a previous waterskiing event.